The year is 2025. It’s November 15th – exactly seven years from today. North Korea’s nuclear weapons program has grown significantly. But as long as they develop their weapons discreetly, the United States looks the other way. They are too significant a pawn in the great power competition with China. The Philippines are no longer our allies. They were crushed under a mountain of Chinese debt. In exchange, they ceded both their U.N. vote as well as our former U.S. Naval Base in Subic Bay. The very one MacArthur vowed to return to after the Japanese pushed him out in 1942. Our two most reliable allies in the region, South Korea and Japan, have been watching these developments very nervously. They face a grim reality: the only way they can counter China’s vast military is with our help. At the first hint that the United States no longer has the will to support its allies, they will be forced to shift their allegiance to China. If that happens vast wealth will leave the United States, as China extends its managed-economic system to international trade. Its new allies will be pressured to trade with China’s preferred partners instead of America. They would want to soften us up before a conflict. Everything that Xi Jinping has done since taking office in November 15th, 2012 has been for this one moment. They even have a name for it: “China 2025.” The pretense of “China 2025” being just about domestic development has long since vanished. On November 1st, China decides that they are finally ready to force the issue. The timing is no accident – it’s the 15 year anniversary of the Xi Jinping’s leadership. So they announce a new policy for the South China Sea: any ships entering the region without permission will be seen as an attack on China by a foreign nation. And they will respond in kind. They have chosen the South China Sea because most of the trade of our allies Japan and Korea passes through those waters. That of course includes oil. Control a country’s access to oil and you control its ability to defend itself. 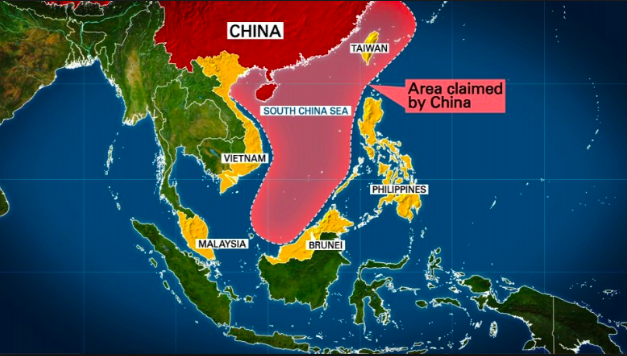 From here on out China alone will decide who enters the South China Sea. At this point the United States has a decision to make. Do we risk war by sailing through? Or do we cede our global position, standing and alliances? A major factor affecting that decision will be who we believe has the military advantage in a conflict. One thing China has done to increase its advantage is to employ a strategy called A2/AD or anti-access/area denial strategy. The goal is to overwhelm us with so many surface to air missiles as to deny us access to enter the South China Sea. The Peoples Liberation Army (PLA) is so committed to denying us access its why they’ve built bases at several strategic locations in the middle of the sea. The three companies most responsible for creating U.S. missile defense systems are: Raytheon (SYM: RTN), Boeing (SYM: BA) and Lockheed Martin (SYM: LMT). These are all solid companies. But their stocks are selling for close to what they are worth. As an investor, the opportunity is in the smaller defense companies whose own systems work to strengthen the other ones. And it’s stocks of these defense contractors that offer investors the most upside. One of these small companies has recently developed a newly advanced system of unmanned vehicles that can automatically detect moving targets. That’s critical if the goal is to identify incoming missiles and shoot them out of the sky before they hit you. This has made its stock the subject of takeover rumors recently. Lockheed Martin, which develops the THAAD anti-missile system, is seen as the potential buyer. It’s also the reason we cover the stock in this weeks issue of Takeover Targets.